i checked out not one, but five Winnie-the-Pooh books today, and a collection of Beatrix Potter stories as well. 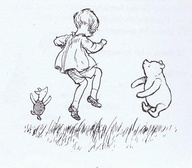 i’ve read the first Pooh book now (called simply Winnie-the-Pooh), and it looks and feels and sounds and reads just like the sort of format i want for Twiry. But there’s no need to decide too quickly. i’d better finish my research first. What a burden, reading delightful children’s stories. One of the Pooh books is actually “in the tradition of A.A. Milne,” so i don’t consider it “real Pooh,” but it still might help me gauge a good length for my book. The author, David Benedictus, has written exactly ten stories (just like Milne’s two books), but they are a good deal longer than the original stories. My guess is too long, given that i’m torn between modeling mine after Pooh (around 2K words per story) and Miss Potter’s stories (around 1100 each). Benedictus’ stories run closer to 2700 words apiece, on average. Still, it’ll be a fun read, and one never knows if the pacing of his stories will sound more like what i’m imagining once i’ve started reading them, even if they aren’t canon. i still need to read The House at Pooh Corner. Then tomorrow i’ll read through the Beatrix Potter stories, and one way or another i’ll decide on an appropriate word count goal. Then on Thursday it’s writing time!